Do you feel pain? Can not go to hospital for some reasons, or need to kill pain before you go to hospital? What one does in these cases? According to the PRWeb, there is a way out without receiving any bills as MedFaxx has announced the release of the first FDA, insurance reimbursable unit. It combines the most used form of electrotherapy in the world clinically for chronic pain, interferential with TENS (transcutaneous electrical nerve stimulation) which is the most used form of electrotherapy for chronic pain outside the clinic. The Infrex Plus unit offers agonizing pain sufferers self-treatment without the use of narcotics, at home or work, on an as needed basis. The most beneficial feature of interferential is immediate pain relief, a patient can treat at home, work, or wherever pain starts, whenever it starts, patients can obtain relief without having to go to clinics, no deserving patients will be denied access to its equipment due to lack of funds. New-patented engineering technology now allows the use of portable, rechargeable batteries that can sustain enough energy for the patient to receive up to two treatments using only the battery system, as it is mentioned at PRWeb. But it is better the unit be plugged into a wall outlet with the AC adaptor. 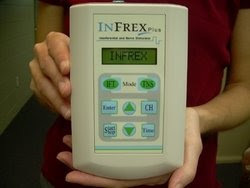 A free trial of the Infrex Plus unit gives patients opportunities to determine its efficacy before any purchase is made.